Below I list some fun and educational activities, we will be doing during our summer break (other than the play area visits, of course). Jigsaw puzzles are great for problem-solving and sequencing skills. We have collected loads of them, over the last couple of years. With all sorts of characters, cardboard, wooden and foam puzzles, tabletop and floor puzzles – you name it and we have it. From Mickey Mouse, McQueen and Chota Bheem, to animals, the alphabet, to a world map – we have them all. My 4 year old has loved solving them since he was 2.5 years old and my 2 year old is now starting to solve some simple wooden ones too. I recently bought him a puzzle Feather Fix from TicTacToe, which is aimed specifically at the age group of 2.5 to 3.5 years. He is slowly beginning to understand how to solve the puzzle by joining various parts to make a particular bird. My elder son got introduced to memory games by his older cousin sister and her memory game. 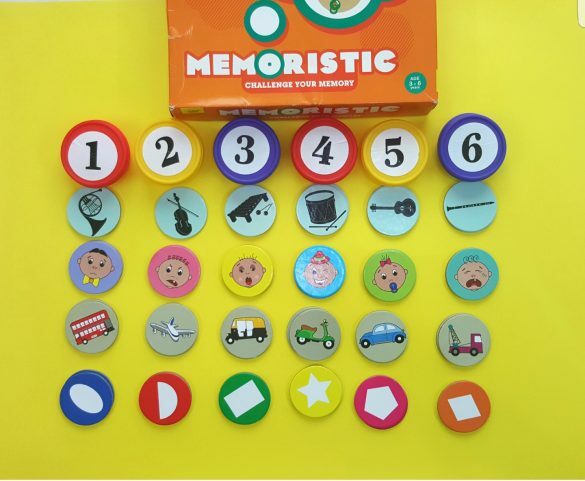 I have also ordered Memoristic, a fun memory game from TicTacToe. It is a new-age game with different levels of difficulty, depending on the number of players and their age and skill levels. As a child, I loved playing memory games with a stack of regular playing cards or UNO cards. It’s one of the easiest to create at home too. Here is a link for some memory game printables. ” Spot it!, a.k.a. Dobble, is a simple pattern recognition game in which players try to find an image shown on two cards. This game is excellent for building observational skills and fast reflexes. My elder son now plays the regular (ages 7 & up) version of the game, but there are other, easier versions of the game for younger age groups, too. Available at souq.com and other toy stores across UAE. These can be fun to do and a good revision of what’s taught at school, so younger kids don’t forget all that was taught. From maths and counting ones, to alphabet, to puzzles like mazes, simple word searches, joining the dots, etc., we have worked on a few of them in the past. There is so much choice out there! We have ordered a few activity books from a local one-stop value shop for mums, Kidore.com and looking forward to cracking them soon. We all know about the benefits of reading to young children, but still it is an activity I do not do as much with my children yet. I have recently put up book shelves in their room where their books are easily accessible to them to pull-out and browse themselves. I am hoping to do at least one story a day to start with during the summer break. I am looking at joining a library too, to make the reading journey even more fun. We normally do a lot of follow-up art & craft activities relating to our favorite stories too, like this Hot-Air balloon craft. These were a life-saver when my younger son was born. It was a gift from the new baby for his older brother, when he came to see him at the hospital! In those initial days, my older son spent hours making different scenes and scenarios, while I was busy feeding and changing diapers for the younger one. Each book has around 168 reusable stickers and 5 scenario sheets, relating to a particular theme. Children can create and re-create different scenarios and stories. We have the Habitats and Transport themed ones…perfect for little boys. These books are great for fine motor skills and imaginative play. Our mom-son duo (me with my older son, while the younger one naps) loves to do everything arty. From creating puffy paint to coloring mandalas and making various themed crafts, we love it all. Activities like coloring, painting, cutting, pasting, etc. are great fun for most kids and good for pencil grasp and motor skills. Additionally, it is good exercise for their creative minds. Do check the Getting Crafty section of this site and keep up with me on Instagram to see various crafts we will be creating over the summers. Games and toys like supermarket shopping, doctor sets, kitchen play sets, doll houses, construction equipment and even Lego and other blocks are great to expand their imaginations and creativity. How are you planning to spend your summer? Here’s wishing you a great summer, wherever you are. Drop me a line below if any of these ideas help you and your children! Please leave me a comment if you like these ideas and would like to see more ideas for young kids. Thanks for the ideas! God help us during the summer months in entertaining the little ones!!! Loved all the ideas above. I also like to spend time reading colourful books with my little one. I’m going to try some of these ideas out! We love doing most of these activities, especially the activity books! They are great for learning and fun too. Loved the various ideas. I am sure gonna takeaway a few. These are super ideas and so simple to adapt to older kiddies too! goodluck..That’s great ideas!for learning and fun too.